We sometimes imagine a breast tumour to be a self-contained lump of cancer cells that have ‘gone rogue’, working on their own and no longer cooperating with normal cells. But in fact the opposite is true – a tumour is constantly interacting with all kinds of cells in its local area, and is actually exploiting and recruiting these cells to help the cancer grow and spread throughout the body. One group of cells involved in this are called fibroblasts, which exist throughout the body, and construct a scaffold to which all cells attach. Breast tumours are able to manipulate these fibroblasts (which are then called ‘Cancer Associated Fibroblasts’, or CAFs) so that they help the tumours grow and survive. We already know that breast tumours which have recruited a lot of fibroblasts are more aggressive and that these tumours are more likely spread throughout the body. What hasn’t been known is exactly how breast tumours recruit fibroblasts; what is the message that tumours send to fibroblasts? A team of Breast Cancer Now funded researchers think they have found an answer. The scientists were led by Professor Clare Isacke, based at the Breast Cancer Now Toby Robins Research Centre at the Institute of Cancer Research in London. Wnt7a By comparing aggressive breast tumours which are able to recruit fibroblasts, and less-aggressive tumours which cannot, they found that aggressive breast cancer cells secrete a protein called Wnt7a, which can convert normal fibroblasts into CAFs that could help the spread of breast cancer. They found in mice that blocking the production of Wnt7a reduced the spread of breast cancer to the lung. Crucially, they also found that Wnt7a could be used in the future to predict the outlook for patients: high levels of Wnt7a in breast tumours were more common in more aggressive breast cancer types, and were associated with an increased risk of breast cancer spreading and so reduced chances of survival for patients. This research is at an early stage, but finding what message breast cancer cells are sending to fibroblasts is an important discovery. The next step for Professor Isacke and her team is to understand what’s being sent in the opposite direction – that is, what messages these fibroblasts are sending breast tumours and how fibroblasts help breast cancer to grow and spread. Understanding more about how breast tumours interact with (and exploit) the non-cancer cells around them could lead to new treatments to stop the growth and spread of breast cancer. 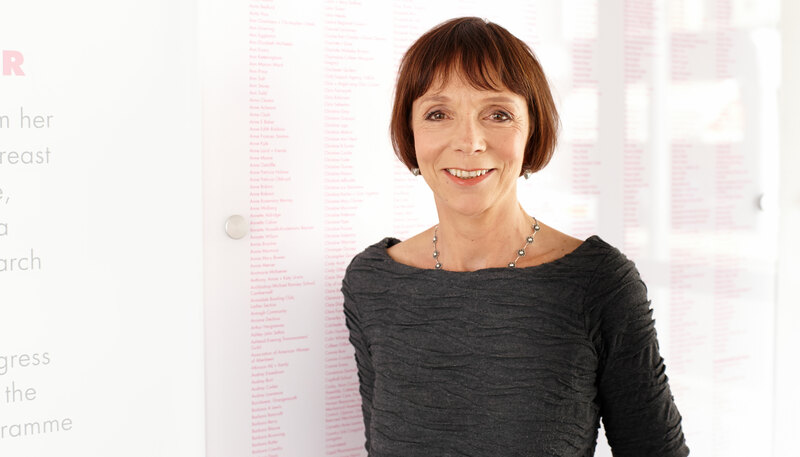 Professor Clare Isacke’s research at the Breast Cancer Now Research Centre in London is all to do with understanding how breast tumours interact with their local environment.